On Friday March 21st 2014, the Ex Elettrofonica Gallery presented Disturbances, an unseen project by Leonid Tsvetkov, curated by Manuela Pacella. Disturbances is the natural evolution of Everyday Downfall, the work realized by the artist during his period of residency at the American Academy in Rome, presented to the public in February 2013. Everyday Downfall began from the interest that Tsvetkov has always had in the archaeological find as a material expression of habits and customs of the past and, above all, as a key to reading what today might potentially remain and become finds for archaeologists of the future. The primary inspiration was Monte Testaccio, a place the artist described as “a landscape of garbage”. The fascinating aspect of Monte Testaccio lies not only in the fact that it is made up of amphora fragments from the second and third centuries AD that originated from Spain, but that today this dump is held to have a high aesthetic – as well as archaeological – value. Starting from this premise, the artist began collecting scrap materials of daily life, especially food packaging. Concrete moulds of these containers (of various shapes and sizes) were then displayed on the ground of the atrium of the American Academy, in close dialogue with the archaeological finds kept there and creating an ideal urban landscape. After the exhibition, Tsvetkov continued his project by “abandoning” these moulds in all the archaeological areas of Rome and its environs. 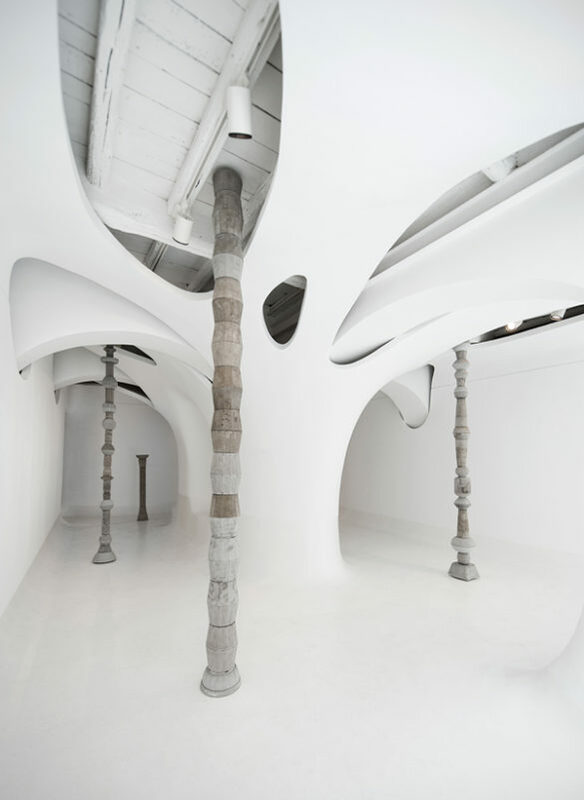 For Ex Elettrofonica the artist has devised an installation that will cut the gallery space vertically, through the insertion of groups of columns of various dimensions and heights, created by placing the concrete moulds of the most disparate industrial scraps one on top of another. These vertical incisions force the visitor to walk the exhibition space in a conscious way and to observe the columns as artistic productions made with what normally we don’t look at but throw away. As well as the installation, Tsvetkov will display some of the works on paper that he made in Rome between 2012 and 2013, whose basis consisted of floor plans and architectural reliefs of places like the Vatican, submitted then to a process of electroplating. Through this process the artist renders the original paper no longer legible and creates new landscapes. This series of works confirms the modus operandi of Tsvetkov, who likes to operate on his materials just enough so that they can reveal already existing chemical or natural processes. The exhibition was organized in collaboration with AlbumArte space | projects for contemporary art, which hosted the artist within the studio residency program 2014. Leonid Tsvetkov (1980, Novgorod, Russia). Selected exhibitions: 2014, WAEN, Assumburg, Hemskerk, NL;Hasselt-Genk Z-33, Hasselt, BE; Sammlung Ludwig, Bamberg, DE; 2013, Cinque Mostre, American Academy in Rome, IT; 2012, Moment of Now, 361Roma Associazione Culturale, Rome, IT; Back to the Future, CBKU, Utrecht, NL; 2011, What’s Next, Museum Tot Zover, Amsterdam, NL; MärklinWorld, Kunsthal KAdE, Amersfoort, NL; Muro Tenente Archeological Park, Apulia, IT; Control Symposium presentation, KNAW, Amsterdam, NL; 2008, Metro Poles: Art in Action, Bronx River Art Center, New York, NY; Thursday The 12th, Kate Werble Gallery, New York, NY; Blank, Beijing, China; 2007, Habitant, HGallery, Bangkok, Tailand; Sculpture Dimensions and Field Variable, San Vito al Tagliamento, IT; Carte Blanche, Elizabeth Dee Gallery, New York, NY; Blank, Ke Contemporary Center for the Arts, Shanghai, China; Horizon, EFA Gallery, New York, NY; Short Stories, Photographs 1890-2006, Macy Art Gallery, New York, NY; 2006,The Armory Show, Represented by Jack Tilton Gallery New York, NY; School Days, Jack Tilton Gallery New York, NY; 2005, Blackboards, Yale University School of Management, New Haven, CT. Awards, residencies and Scholarships: 2013, Internationales Künstlerhaus Villa Concordia Stipendium; Mondriaanfonds Basis Stipendium; 2012,Royal Dutch Fellow. American Academy in Rome. AFAAR 2012-13; 2010, Rijksakademie van Beeldende Kunsten; Van Bijleveltstichting Award; 2009, Prins Bernhard Cultuurfonds, Amsterdam, Netherlands; 2006, Ely Harwood Schless Memorial Fund Prize, Yale University; 2005, Robert Scheolkopf Traveling Scholar, Yale University; 2003, Best of SUNY (Art), Chancellor Scholarship; 2001, Lancelotte and Richard Laster Scholarship; 2000, Rochester Art Supply Sponsors Award; 1999, North American Collegiate Chess Championship. Top Board.